My brain was in serious need of something to cool it down. I wasn't really sure what to get and then there it was, just waiting to tease me with it's one dollar off sale price. 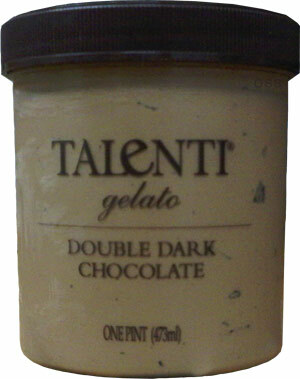 Talenti's Double Dark Chocolate Gelato #3. Freezing cold dark chocolateness sitting there in it's see thru container. Are those dark chocolate chips I see? Off goes the plastic seal and then off goes the lid. Mmmmmmmmmm, dark chocolate. It is a little dry, but not stunningly dry. Maybe the very dense nature of the gelato is offsetting the dryness. I'd say it has struck a nice balance between the dry and the creamy. The dark chocolate chips are small, but they are abundant so I'm getting some in every scoop. They are so small they are more like little flavor bursts more than a full dark chocolate onslaught. I'm definitely enjoying the crunch they are adding. Hmmm, I'm detecting something strange. I can't quiet place it. Not that I have any experience, but I want to say it's almost an alcoholic quality. I know this taste but can't elaborate. Have I mentioned the chips everywhere? They are right on the money here, very nice. Ok, ingredient check time: Hmmm, everything looks normal ...wait, here it is, Vermouth! Ha! I knew it was an alcohol flavor. I may not drink, but that doesn't mean I can't pick up on these things. I wonder why they do that? "Semisweet Callebaut Chocolate morsels imported from Belgian are immersed in dark chocolate gelato together with a splash of vermouth, which gives new tempting definition to smooth and rich"
I like it for being different and I appreciate the level of quality in their products. I don't foresee buying this again unless I was pairing it with some like really fancy dessert. I discovered this gelato in a supermarket on a visit to Florida. It is the best ice cream I've ever tasted...dense, layered bitter chocolate experience; creamy smooth; just the right number of crunchy choc chips to provide texture. Now I'm back in NC and can't get this divine stuff! I tried this flavor recently and while the texture was incredible, it made me say something I never though I would: it was TOO rich. I didn't think that was possible! I'm obsessed with finding the richest chocolate possible. But this gave my thought a gross burning feeling...plus made me feel sickingly full after just half a cup. @MumB: Glad you found it! @Jodi: There's no doubting this is a very powerful treat. I'll give Talenti this, they don't mess around! Try the Champagne Peach sorbetto from them if you can find it. It literally bubbles on your tongue. I love it. Just tried a pint of the Belgian Milk Chocolate gelato...simply a delightfully sinful taste of heaven! My name is David C. from SC, and I am eating the double chocolate right now and yes it is amazing... But in truth their Belgian Milk Chocolate is the best I've had from them. And the containers definately hold their value for my odd homemade left-overs =). Chocolate lovers, the Belgian Milk Chocolate is creamy and tasty...but it tastes more like milk than chocolate. Boo :-( If you are a chocoholic, as I am, the Double Dark Chocolate is hands-down the best chocolate ice cream/gelato on the market-the vermouth being the deal-sealer. It tastes like frozen chocolate mousse. Kudos Talenti. I actually LOVE this flavor....but just so you know.... It would take approximately 6 to 8 hours in around 450 degree f in the OVEN to actually cook out ALL of alcohol. I know all of people says it cooks out, but that is in fact a word of mouth LIE. I went around and top chefs and chemists will tell you the honest truth. It cooks out SOME alcohol, but in a pan? for fifteen minutes? Less than one percent. I don't know who started it, but it was probably some mother who misinterpreted the information without actually consulting a scientist. But most professional cooks now a days take advantage of this, but certain cooking wines boost flavor and they don't pour in a whole lot of it just to make sure. People give alcohol too much of a pillar. Alcohol occurs naturally in ALL FRUITS. The more acidic-the more alcohol. Though it is very little, you are still consuming alcohol with every orange slice, every tart strawberry, every bit of grape. The key is moderation. People forget this. And rich...? Seriously. This was not rich compared to the DUTCH chocolate gelato in the store called MELT in the SF Mall. That was so rich I had to have a creme brulee gelato to balance it out. I've had MANY gelatos and even been in the presence of my friend's GUINESS (yes the beer) Gelato. I dare not try that one! A true chocoholic would consider this as pleasant and nice. Rich? Hardly. A friend told me about this gelato and I bought a pint of the Double Dark Chocolate, being a chocoholic. I wasn't expecting it to live up to the raves my friend gave it but after a few bites I was in love! I intended to eat a little of it and ended up eating the whole pint. I just couldn't stop!! I have tried several other flavors but none are as good as this. I have to stick to the gluten free flavors. The fact that there is no HFCS is a big bonus too. I am officially addicted and don't think I can ever go back to ice-cream again. I just noticed that these comments go back to 2010. I didn't realize this had been around that long. Where was I? Don't feel bad Debi, Talenti has come a long way in the last few years, we're just glad to have you in the fan club! I'm late to this yet again but I adore this flavor. I wish other companies would do the chocolate chocolate chip thing (I do like the Breyers truffle) and with the dark chocolate, it's sooooo good. For me, there really is no such thing as too much chocolate! I usually prefer larger chips but I find that with the delicate Talenti base, I like the slivers. Yum!! !